Hi loves! Surprise surprise, Loqi isn't here today (she will be tomorrow!) because today is a special day, piCture pOlish Blog Fest 2013 is here! I am so happy I was chosen to participate. This year's theme is "Year of the Blogger" and it is all about celebrating us bloggers and what we do! What makes this edition extra special, is the challenge that is connected to it. 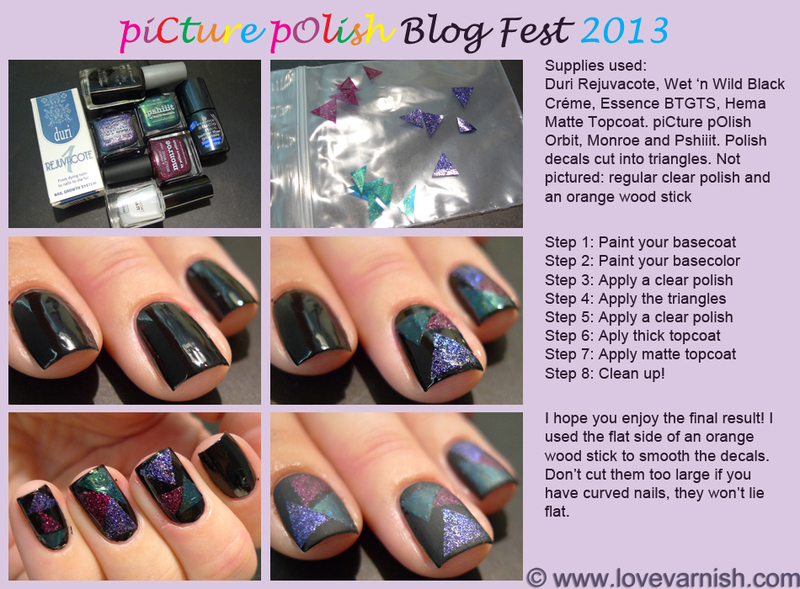 All manicures that are created for this Blog Fest, have a chance at winning 1 of the 3 awards available. The prizes? 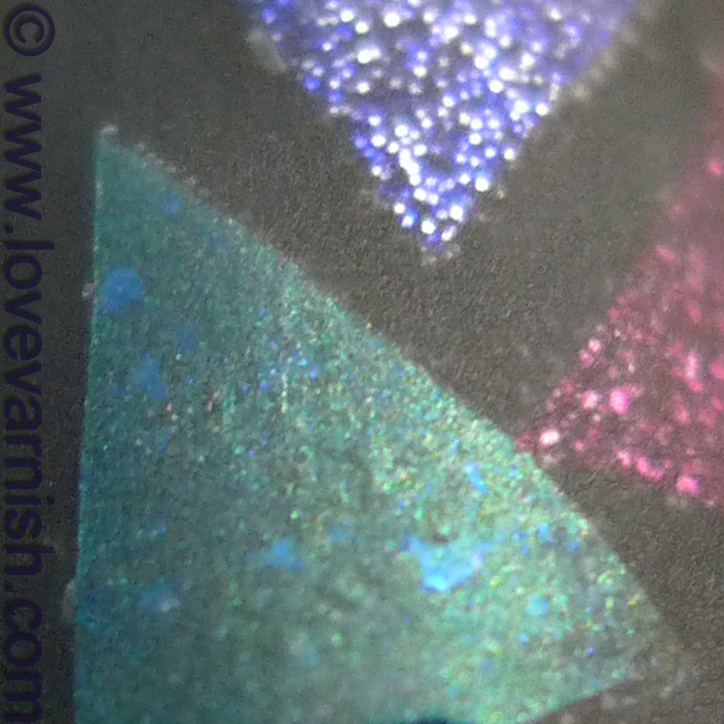 Creating a collaboration shade with piCture pOlish, being released in 2014! Oh my gosh, how awesome would that be? I have no idea right now who else is taking part in this Blog Fest, I think I'll have amazing competition, but who knows? The voting for those awards will be done on Pinterest so please make sure to check it out for the voting and maybe help me win this? Now, for the actual manicure. The challenge presented to us was to create a nailart manicure with the 3 shades provided (for me those are Orbit, Monroe and Pshiiit). There is also a pictorial for you so you can recreate this look. I'll admit I did have a bit of a hard time thinking of something with these 3 shades. Orbit is quite opaque in 1 coat, but Pshiiit definitely needs 3. I also wanted to do something I hadn't done before (yeah let's make this extra challenging shall we?) and that's when I thought of polish decals! That way I could get "opaque" looks on all 3 polishes, and I never tried it before. A great post about creating these little decals can be found over at my friend Bregje from Oooh, Shinies! I started with prepping the decals, by painting large strips of polish on ziplock baggies. This needs to dry for a while, and you might need to do multiple layers of polish to get a good looking sheet of polish. After it dried, I gently peeled off the ziplock baggie and was left with a polish sheet. I grabbed a pair of scissors and cut out little triangles. Be careful that these little pieces don't blow away or anything! 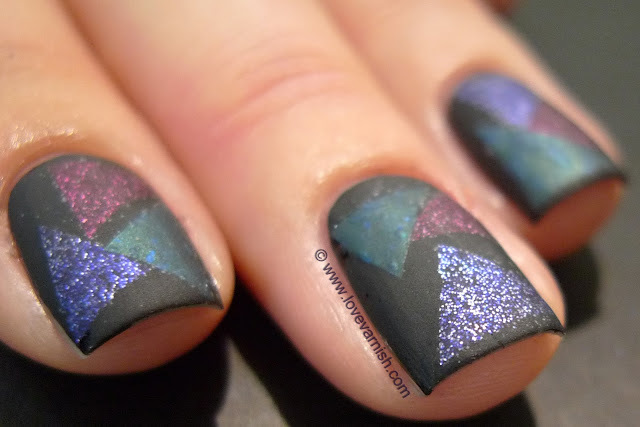 After I prepped all the little triangles, I went ahead and started to work on my nails themselves. After putting on my basecoat (Duri Rejuvacote) I used 1 coat of a black creme polish (step 1 and step 2). I let this dry again for a bit. After it dries, take a regular clear polish (no quick dry) and paint one nail with it (step 3). Then, take your polish decals and stick them to the wet clear polish (step 4). This serves as the glue. After you applied the decals as you like, seal it in with another layer of clear polish (step 5). Repeat these steps for all the nails. It doesn't look very pretty yet, but we will get there! You'll need a thicker topcoat now to smooth it all (step 6). I use Essence Better Than Gel Top Sealer, but you could also use Seche Vite, Gelous or whatever topcoat you prefer. Again, let it dry. Then, finish it off with a matte topcoat (step 7)! This allows the different shapes to stand out better against the basecolor you used. Some clean up (I like to do this as the final step but you can also do this before topcoat if you like it better that way - step 8). All done! I hope you (my loyal subscribers ♥) enjoyed this manicure and want to vote for this to win 1 of 3 awards. 1 of the other awards will be voted by all participants, and 1 by Jules & Megs. I absolutely loved this challenge and while it took me a moment to come up with something, I really think I created a fun, exciting and unique manicure. All 3 shades combine beautiful this way and I want to thank Jules & Megs for letting me participate. piCture pOlish is available on their own website, all information about shipping can be found here, and more information on other retailers is found here. piCture pOlish is also on Facebook, Pinterest, Instagram, Twitter and You Tube. Gorgeous design! Love what you came up with. It looks so awesome mattified :) great job! I love that you paired these colors with black...so gorgeous! Thanks Emily, it was the only idea I had to use all 3 colors on one nail! The matte is just perfect for this! Yeah I am so excited ♥. These are really cool! 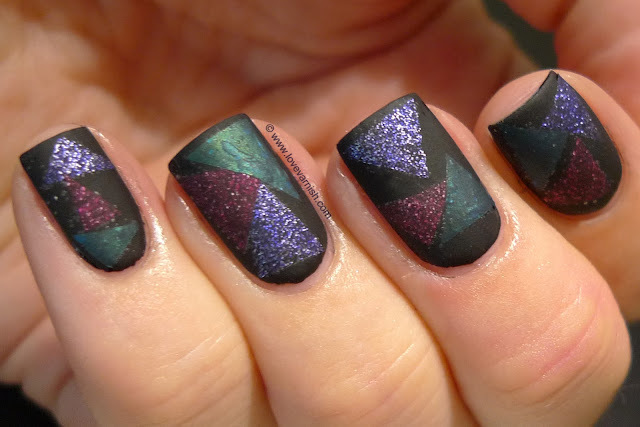 Matte on sparkles is always so interesting. Thanks! Yeah matte totally alters the look with polishes like these :). You should! And thanks for your sweet comment dear :).